Yes, in case you are wondering, it took a minute or two to find a proper header for this one. 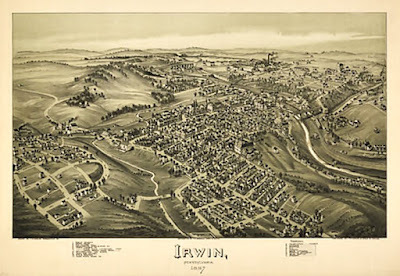 Although the Borough of Irwin was claimed to of begun in simple form at an earlier date, from Jacktown Hill to Veterans Bridge, it was incorporated back in 1864. 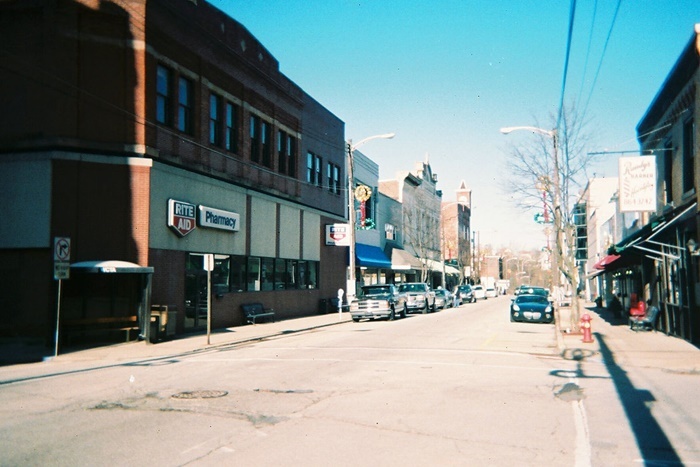 Located on Route 30 twenty-two miles southeast of Pittsburgh and nearly a square mile in size, the borough lies near the geographical center of North Huntington township. The township holds the honor of being a part of Westmoreland County when it was created out of Bedford in 1773. The Forbes Road lay to the north and the Braddock Road was further to the southwest, but as a Reverend Dietrich once pointed out in no uncertain terms, this did not deter early settlers from finding in the Brush Creek Valley between the Big Sewickley Creek and Turtle Creek an ideal position for living quarters: "It must have been an inspiring sight to view its winding expanse from some high ridge as the lone explorer crossed the surrounding water-shed to see the irregular hills and dales, carpeted with the original forests in shades of green and brown." In a rather unique situation with the unanimous decision of the council in 2013, the borough purchased the Lamp Theater from The Westmoreland Cultural Trust for the price of one whole dollar to hold on to a grant for $500,000 while matching the funds needed for this acquisition. Quite a feat in itself. Last year they even drew in a big talent from this region with The Clark's. One mile to the west of the Pennsylvania Turnpike they perform quality Concerts in the Park at the Irwin Park Amphitheater, properly enough named, precisely at 6:30 in the milder months of the year. This has been taking place, without fail, (as far as I am aware), for twenty-six years to date. These concerts bring in talent from all around the region and are FREE to the public to attend and enjoy, (brought to you by the Irwin Civic Activities Committee). As the borough developed into the late 1800's, later concerns of Irwin centered around the large coal deposits, the Westmoreland Coal, controlled by George Ross Scull, and the Penn Gas Coal companies being two examples, while iron foundries, mills and the mirror factories helped build Irwin into a booming town putting it firmly on the map. The modern population hovers near the 4,000 resident mark. If there is one thing going for Irwin today, they have a good choice in restaurants-the Firepit, Cenacolo and the Arena Sports Grille know how to serve up a meal! The town also does a big Annual Christmas House Tour in December. Brush Hill, the former Scull House was named for John Irwin Scull who married his daughter, Mary and became the founder of the Pittsburgh Post-Gazette. This historic mansion was first built in 1798. Incorporating the once popular Federal Era type architecture, the structure itself said to be made of fieldstone and sandstone. The particular style used associates the site with classicism of Regency, (late Georgian), and french Empire architecture closely connected to ideals of the early American republic which derived much of its founding aspirations from ancient Greece and Rome. For those with more than a casual interest, famous architects of the style included Benjamin Latrobe, Thomas Jefferson and Charles Bulfinch. In the 1950's the place was upgraded from a state of disrepair by a denist, Dr. John Hudson. "Brush Hill" was added to the National Register of Historic Places in 1975. Later, according to a Tribune-Review article from December of 2007, Brush Hill house was further restored by owners Don and Dilly Miller. During renovation some archaic finds were made. More particular material may be found at irwinborough.org. As the good Reverend further related, the township was conveniently crossed through with the four important Indian trails of Nemacolin at Circleville running to the Mon river eastward and then south to Scottdale and on through Dunbar's Gap to the Great Meadows; the Allegheny-Laurel Hill Trail which in the east found it's origin at old Shannopin's Town traveling west near the Allegheny River through Pittsburgh to Ligonier and to Bedford, which he correctly explains was the basic route of Forbes' army in the eventful year of 1758. Then there are the lesser trails through New Florence and the Ligonier Valley southward and a trail north of New Kensington heading to the Juniata and on to the Susquehanna river system. Of course, later this was on the "great road" of the Lincoln Highway and a part of the first railroad, the Pennsylvania R x R, in fact. 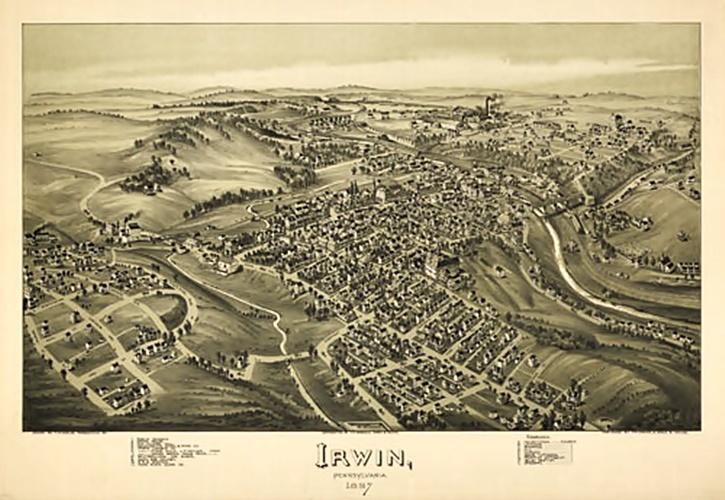 Saving information that may well be the best for last, the founder of the town was John Irwin, born to James and Jane Irwin in 1811. Through the inheritance of his father's lands he soon became a leading merchant and the most prominent member of the early community. Colonel John Irwin was born in Ireland in 1740 and arrived in the colonies in the year 1762. The gentleman in question was known to be at Fort Pitt in 1766, while he may of seen some action there as he was the army's Chief Commisary Officer and was stationed here for a time. After the Treaty of Fort Stanwix, an early settler of Westmoreland County, he made the purchase of the Brush Hill tract at the mouth of Bushy Run to the south near Fort Walthour. He then proceeded to build a cabin near the 'Scull House' to the east of Irwin later occupied by his grandson. While there, he became a trader, mostly in the lucrative fur market with the nearby Indian folk. It was also burned by the Indian raids in 1782. Finally, John lived in a stone house near the year 1792 and took up permanent residence after his other establishments had burned to the ground. In spite of these conditions he was the Deputy Commissioner for the Western Divison of the Continental Army during the Revolutionary War, naturally a proud reminder of the origins of this location. By 1821, in infirm health, he resigned his illustrious position as Associate Justice of Westmoreland County and died in 1822. It was the colonel's nephew of the same name that founded the borough of Irwin. In 1783, his brother James came to America and joined John in this region and created what was to become Jacktown or Jacksonville. By the creation and opening of the Pittsbugh and Greensburg Road, the place gained advantages as a stagecoach stop and developed a sense of early business, and by becoming a toll road in 1816, the boom of progress slowly, yet inexorably began. Thus we have noted another part of our exciting Fayette/Westmoreland history.